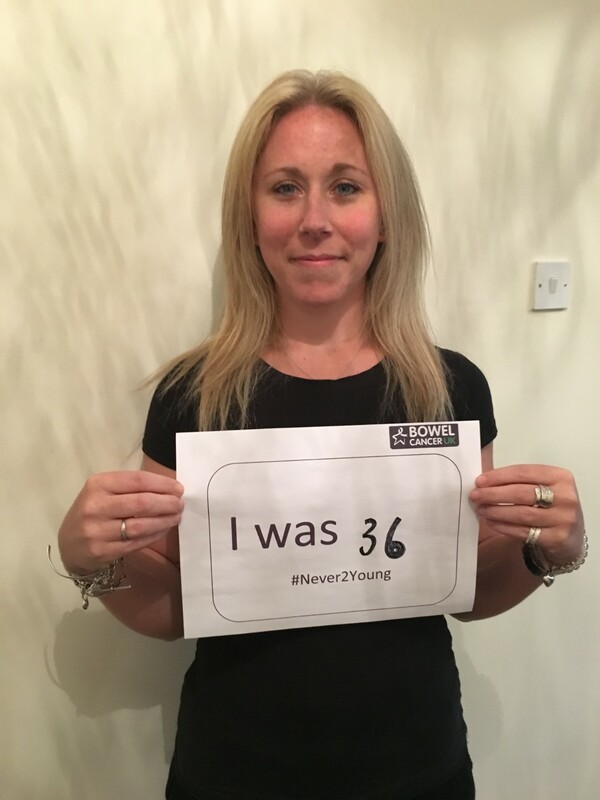 I was diagnosed with stage 2 bowel cancer in May 2018, at the age of 36. I went to give blood in December 2017, but couldn’t because my iron levels were too low. I went to the GP and had some blood tests, but there was no obvious reason for my anaemia. Because he couldn’t find a reason he made an urgent referral (should be seen within 2 weeks) for an endoscopy (camera down the throat) as he though it could be a stomach ulcer. Unfortunately, the first appointment they could offer was in June 2018. My doctor was fantastic. He wasn’t satisfied with the waiting time so he persisted and I had my endoscopy in February 2018, which came back all clear. This was clear so I was seen for a colonoscopy which was in March 2018 and they discovered a tumour in my colon along with multiple polyps. The tumour had been bleeding internally and had been contributing to my anaemia. I hadn’t had any obvious bowel cancer symptoms, so it came as a big shock. I had my colon removed through key hole surgery (sub-total colectomy) in April 2018 along with the tumour and 20 lymph nodes. The biopsy’s confirmed that my cancer was stage 2 with no spread to other organs or lymph nodes. Hearing that it hadn’t spread was a relief, but I was nervous about what was to come next. I recovered well from the surgery, I take tablets to manage the diarrhea but I have control of my bowels and I am learning what foods I can’t tolerate. In June 2018 I began chemotherapy, my oncologist suggested I had 8 cycles of Capox each lasting 3 weeks and would take 6 months to complete. 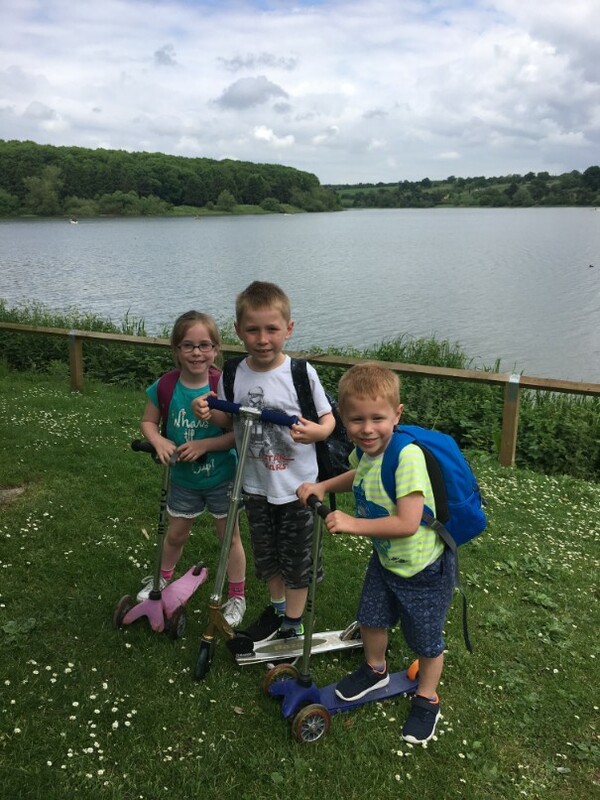 The first couple of cycle went quite smoothly, I had some side effects that I had been warned about (sensitivity to cold, peripheral neuropathy, fatigue, muscle and joint pain) but it was manageable. 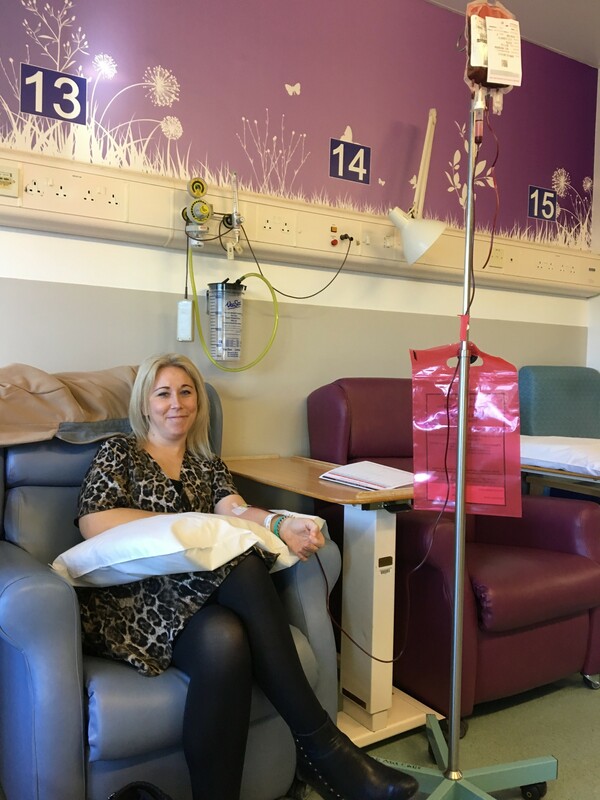 As the cycles progressed my body started to take longer to recover between cycles and it was becoming increasingly hard to find a vein for the IV drugs, as a result I had very sore arms with limited mobility. During the 6 months, treatment was delayed 3 times due to my platelets not revering quickly enough between cycles and on my penultimate cycle I had a blood transfusion as my red blood cell count had dropped extremely low. This allowed me to carry out cycle 6 but then my oncologist decided to end the treatment and not do the last 2 rounds. He felt that my body was too fatigued and wasn’t recovering quickly enough to cope with further treatment. Un expectedly In November 2018 I rang the bell to signify the end of treatment. It was very emotional, I was told to go and live my life, but I didn’t know how to do that. Towards the end of the treatment I began having counselling which I arranged through a local charity called Coping with Cancer. These sessions allowed me to process everything that had happened, and it came at a good time as I was feeling lost without the regularity of treatment and appointments. I felt very low for a couple of months, caused partly by the withdrawal to the toxic drugs but I was also struggling with a loss of identity. I decided to sign up for some personal training sessions at my gym to help build my confidence and fitness levels. They have really helped me to increase my strength and confidence in my body. I am now attending exercise classes regularly and I can see a glimmer of the old me coming back just with a few more scars both physically and mentally. The next stage are the follow up checks (scans/camera scope’s, blood tests) and I’m glad that I am being closely monitored for the next 5 years. 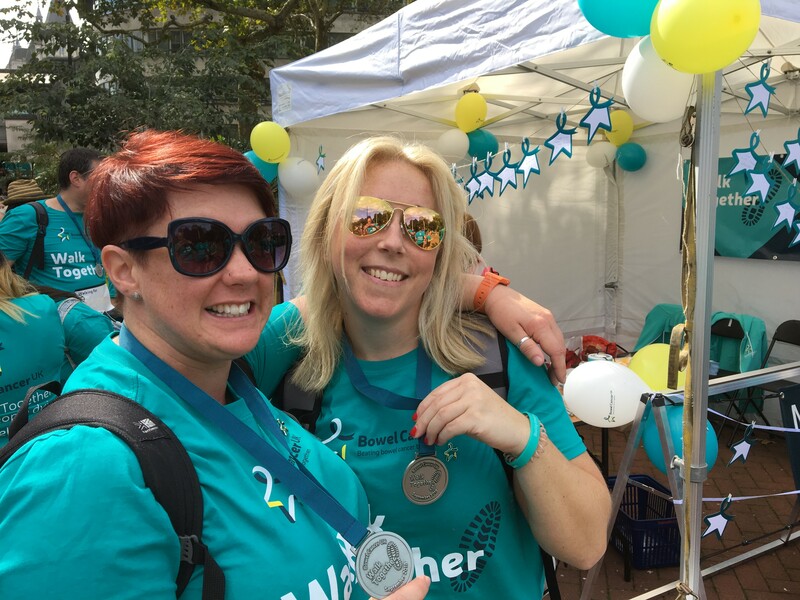 I hadn’t had any obvious bowel cancer symptoms, so it came as a big shock. Its been a whirlwind and all happened so quickly that it has been hard to process but I have a new-found respect for life as you never know how quickly things can change but I must remain positive for my children. Despite this awful situation I have been introduced to some amazing people through the online community linked to the charity and their support has been invaluable. Being able to speak to people that understand exactly what you are going through is very comforting. 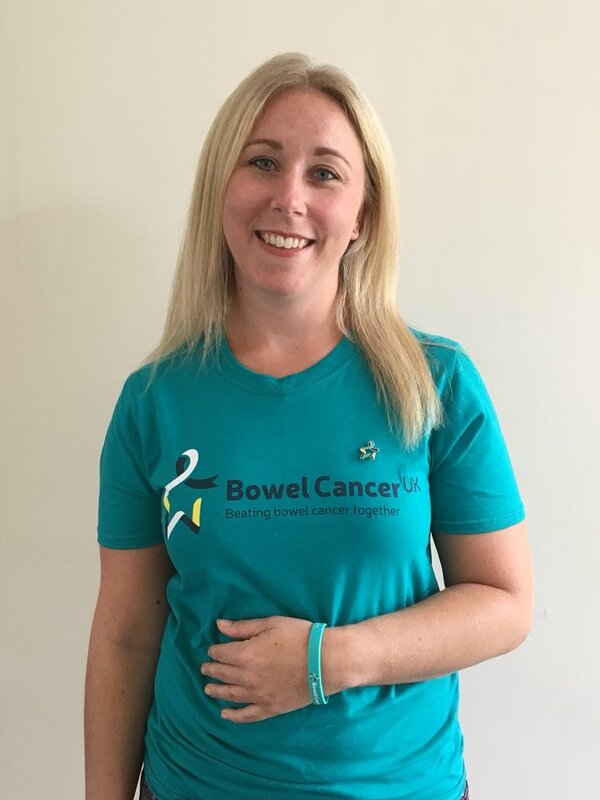 I am passionate about raising awareness about the symptoms of bowel cancer and helping to raised funds. I have been privileged enough to take part in a couple of radio, TV and newspaper interviews sharing my experience in order to raise awareness. My next goal is to complete the London-Paris bike ride in 2020 to raise vital funds for Bowel Cancer UK and I am sure I’ll be doing plenty in between to show my support for this amazing charity that have been so supportive throughout. You can read more about Kate's journey on her blog https://thebadbowelblog.wordpress.com/.